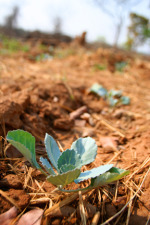 The new vegetable garden will help ensure that 29 of Susu's children are fed a nutritious meal dailyDescribed as a 'diamond in the rough' by Lonely Planet, Zambia conjures up images of the Victoria Falls and Lake Kariba for most. And as breathtaking as the attractions of this country are, it is in the tucked away villages, away from the tourist hustle and bustle, that you will find the true gems of Zambia: its people. About an hour and a half from Zambia's original mining city, Kabwe, is the little-known community of Susu. The people here are extremely impoverished and this small town is isolated from the city and its education facilities and health services. Hands at Work, through our model of mobilising and equipping local Christians to effectively care for the poorest of the poor, has been partnering with Susu community since 2004. Friends of Hands at Work, Nurses for Africa, recently visited the community to see to its basic healthcare needs. 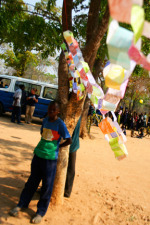 Paper chains ushered in Susu's visitorsThe group of eight nurses made their way to Susu in September this year via a bumpy road, meandering through thick bush, until they reached a clearing where they were met by a welcoming, brightly coloured display of paper chains made by the community's 187 children. It was obvious to the visitors that Susu community is setting the bar high: The community-based organisation, comprising of local volunteers and supported by Hands at Work, is currently ensuring that 29 of the most vulnerable children receive a nutritious, daily meal, which will soon by supplemented by their new vegetable garden. The organisation's care workers also make regular home visits to orphaned and vulnerable children, bringing encouragement and love. And a life-saving borehole has been sunk which supplies clean drinking water to the whole community. Pupils listen attentively to their volunteer teacher in their outdoor classroomBy far the most outstanding trait of this community, however, is its commitment to educating its children: “Education is the key to success” is a proudly displayed slogan here and Susu's four volunteer teachers are dedicated to teaching their pupils despite a desperate lack of resources. The community has no government school and had the community-based organisation not stepped in, Susu's children would be left illiterate and without an opportunity to escape the poverty trap. Class is held in make-shift structures or under trees, but when it rains in this tropical area, school is often cancelled. The community is not taking it lying down, though: In faith, they have started firing clay bricks in a kiln in the hope that funds for cement and other materials would be supplied. The schooling challenge, unfortunately, is not the only one. Susu is about 15 km from the closest medical clinic. Children and adults alike are suffering from diseases, waterborne or otherwise, that would be a easily treated in a well-equipped facility. What would merely be an irritation to a Westerner, can sometimes be a life-threatening condition in rural communities such as this. The Nurses for Africa team – the forth one to visit Zambia in the 2 years – makes a huge difference with each visit. The nurses from Illinois, US got to work fast and saw to the basic needs of just over 400 people. With a little help from its international friends, this community – determined to beat the odds – has a promising future ahead of it. Read about a previous Nurses for Africa visit here. Have a look at more Susu photos on our Flickr site.